The smartest holistic treatment I’ve tried in a while. I found that many of my clients were eating organic, using organic products in their homes, and then injecting poison into their face every 6 weeks with Botox to keep a younger complexion. I originated a method through acupuncture that works with the muscles and energy channels and uses an inside out approach to have the same youth generating effects. I truly believe that beauty comes from the inside - out. This includes internal medicine, emotional health and spirituality. I love working with authentic self, and the connection to inner and outer beauty. Skin health is based in internal medicine, the skin is the most external expression of internal wellness and thus beauty. I’ve experienced it, but for those who want to try it, what does it entail? Beauty Acupuncture™ is customized to each individual patient and their skin condition. Cups are often used in the session to loosen up the neck and back muscles and a customized body as well as facial acupuncture session come next. I also like to do some acupressure on the body, neck and face with essential oils appropriate for how the patient is currently presenting. Define beauty and how does the combination of cupping and acupuncture enhance it? My definition of beauty is a combination of wellness and authentic self // expression. Beauty Acupuncture™ sessions embrace the most beautiful version of YOU. Cupping is the use of little suction cups on the skin that form a vacuum and sometimes leave the patient with those red or purple circles that sometimes look like bruises. Cupping pulls blood from a deeper level to the surface to release what we call in Chinese medicine “stagnation” and/or “heat”. Bringing the blood to the surface increases circulation and moves lymph from a western standpoint. This can be helpful in treating facial skin conditions through the back. With acupuncture: a needle is inserted into the skin and it causes micro disturbance which causes to body to send it’s natural healing mechanism. The body floods the area with healing response in for form of blood circulation, lymph circulation, and overall energy (Qi). 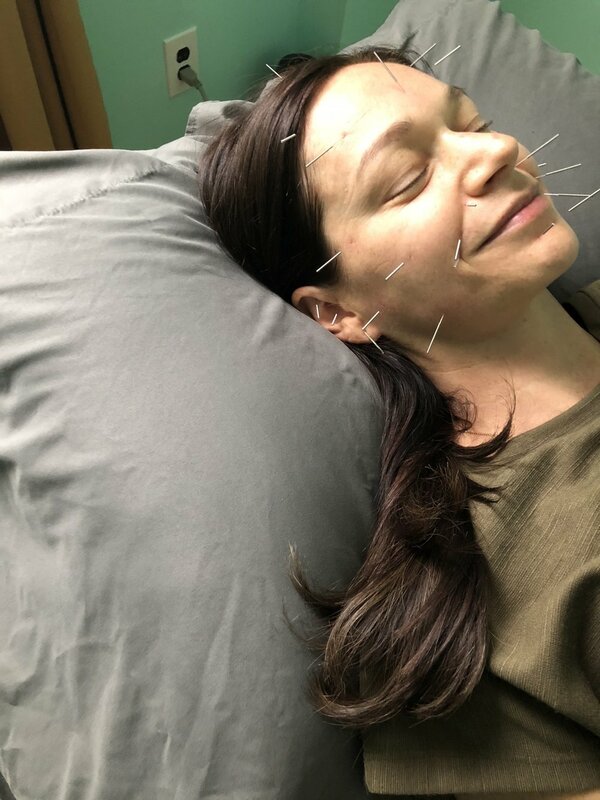 Facial acupuncture specifically helps promote the production of collagen in the face as well relax tense facial muscles. How does Beauty AcupunctureTM work? With Beauty AcupunctureTM, I treat the root cause of the skin condition. It’s beauty from the inside out. Most people’s skin conditions are due to poor circulation, digestive issues, and immunity issues and emotional issues— anxiety and insomnia will disrupt the hormonal balance in the body and often cause pathology in the skin. Skin is the external layer of the human body and you actually have to treat the innermost layers of the body making skin conditions some of the most difficult conditions to treat. The way is to treat the skin is internally. This accelerates the process. Moving the Qi, blood and lymph using the needles in the face directs the treatment to the skin of the face. The real secret is the body points because we treat beauty from the inside out. If all your organs are in order, digestion is good, hormones are balanced and your blood and qi are flowing properly::: then you are going to see it through the expression of the skin. Effects vary as each patient’s issues are unique to their body and constitution. Some common immediate effects include a rosy glow, relaxed facial muscles and thus few muscle lines or muscle wrinkles on the face, less stress, and a more clear and calm feeling overall. How often do recommend someone sees you for a treatment? My goal is always to see patients less and less. However, since effects are cumulative, I recommend that patients come in three weeks in a row to start. After that, we can better determine the appropriate treatment plan and session frequency for desired results.